Do you need a cabin for your property up in the mountains? Schwartz’s Cabins would love to help you construct the cabin of your dreams! We will work with you to custom build the perfect cabin for your specific location and preferences. 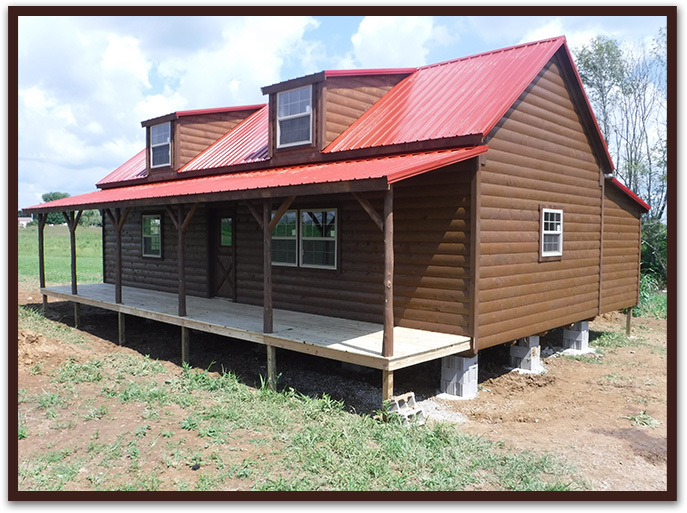 Our Frontier Cabin’s defining feature is the long 6’ wide porch across the front. This porch creates a homey appearance, a delightful spot for a few wooden rocking chairs. Ask for our rustic cedar porch railings and log siding to complete the cabin’s old-fashioned look. The Frontier Cabin includes a 16’ loft with inside stairs for easy access. The loft utilizes cabin space efficiently, giving room for more bedrooms or extra storage space. Or, the loft could be the children’s play area, keeping their toys out from underfoot of the adults visiting in the living room downstairs. See the pictures in the photo gallery for an example of the beautiful wood interior of our cabins. If you would like, we varnish the inside of the cabin for you. We also give the option of installing a kitchen with upper and lower cabinets as well as countertops. Another option available is a mudroom added onto the back of the cabin. This gives a spot for storing boots and coats, keeping your vacation experience more organized. We can build a small porch at the entrance to the mudroom. See below for a complete list of cabin upgrade options. Let your imagination run on the possibilities for your dream cabin. Schwartz’s Cabins is here to serve you with the skill and quality that you’ve been looking for! Give us a call today at 606.763.9252.